Women's Work is a rich magical guide to all phases of female life. From Young Woman to Lover, and from Wife to Mother and beyond, this book tells how to employ traditional African-American conjure work for love, sexual charisma, fertility, childbirth, money drawing, household protection, and keeping your mate at home. 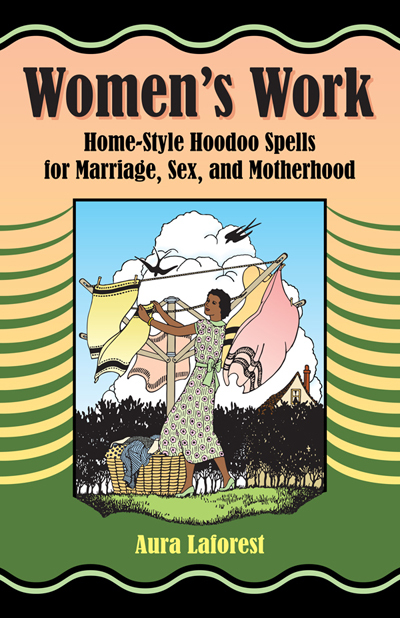 With over 100 authentic hoodoo and rootwork tricks and recipes, Women's Work teaches you the hidden secrets of spell-casting that only women can use. Women's work may never be done, but this book of old-fashioned natural magic gives you clear, solid, and simple ways to help yourself and your family. Not just for women but also for the men they love, Women's Work guides you to a better life. Aura Laforest is a community herbalist and root doctor who wildcrafts, teaches, and consults from her rural home in Quebec, Canada. Order Women's Work from the Lucky Mojo Curio Co.